The works of Raphael and Andrea del Sarto used to be in Hall 26 on the second floor but were moved with the second opening of new rooms of the New Uffizi project. This hall was dominated by two great leading figures of the early XVI century: Florentine Andrea del Sarto and Raphael from Urbino. Now the works are in different halls on the first floor: in Halls 57 and 58 of the New Red Rooms dedicated to Andrea del Sarto and Hall 66 to Raffaello. Andrea del Sarto’s most famous work, the Madonna of the Harpies (1517), is one of the most well-known and is in Hall 58. Based on some verses of the Book of Revelation, this painting allows us to understand the many influences Andrea del Sarto absorbed during his life: the classicism of the Florentine tradition but also the great achievements of Leonardo, Michelangelo and Raphael. 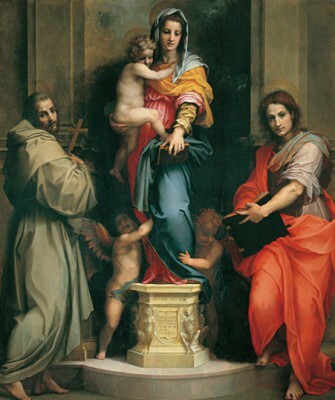 Andrea del Sarto is therefore an important artist to understand the transition from High Renaissance to Mannerism in Florence, though his fame has always been eclipsed by other great names in art history. Take your time to admire the other works in these small rooms before you continue your journey of other artists that came just a few laters after Andrea del Sarto, such as Pontormo and Vasari.